I made these fun Polished Stone atc's for a swap last month and love looking at the balance of the backgrounds I have here so I figured I would share the beauty with you all too :). I stamped on them with my Noir Palette Ink a partial impression of the flower (Flowers & Elements FAE3-06) which is a set I tend to pick up and use quite often! The set takes up 3 whole cd cases and I love them all! Anyway I made the various polished stone backgrounds then cut them to 2 1/4" x 3 1/4", stamped the image on, added a small sentiment in one corner and then added various do-dads from my stash to the opposing corners or some a small spiral clip along the one side. 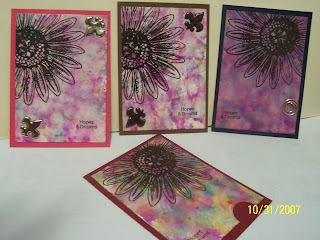 I then mounted them onto pink or burgundy cs to make them the correct size for atc's 2 1/2" x 3 1/2" .